← Isn’t there a saying about curiousity and a cat? I have been meaning to make lotion for a few years now and I finally did it! I had found a recipe for Eczema Fighting Cream over at A Sonoma Garden that I still want to try and she also has a recipe for making hand lotion too. 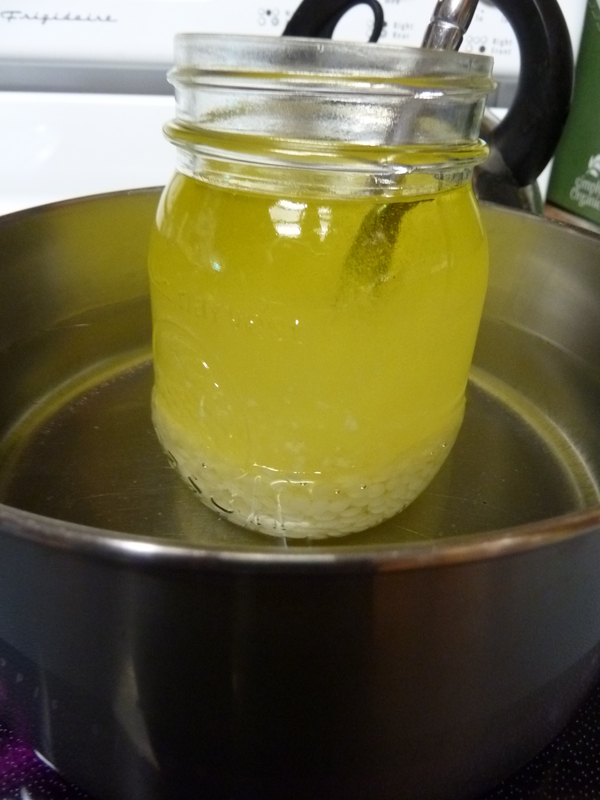 The one I made is How to Make an easy Beeswax Lotion. Just pop over to A Sonoma Garden to get the specifics on her recipe. I can tell you this, it was quite an easy recipe and I was glad that I had all the ingredients on hand: olive oil, coconut oil, beeswax and the optional essential oils (I used Rosemary and Tea Tree combined). The majority of the time involve was stirring the mixture after it was completely melted and cooling on the counter. Stirring every 15 minutes to keep the mixture smooth and combined. I added Rosemary essential oil and Tea Tree essential oil to my lotion. It has a very menthol-medicated scent to it, but I do like it (because I know it is Rosemary). The scent doesn’t linger as I hoped it would. I made this lotion on 30 September. I am solely using it at night right now on both my hands and my feet. It is very greasy going on, but after a few minutes much of it has soaked in. We are still quite warm here outside and we have some humid days coming up. I know I will be using this more as the temperature and humidity drop and my skin starts to dry out more. As a side note, coconut oil is a liquid at my house during the summer months. Our indoor house temperature is 80F. My lotion is quite soft right now, not so soft that I could put it thought a lotion pump, just soft. I imagine it will firm up a bit more as the outdoor and indoor temps cool down and the coconut oil starts to solidify more. I will do another post post after I have used this lotion a while and tell you all about how much (or little) I like this lotion. Soon I also hope to make the Eczema Fighting Cream recipe that I linked to above. I will be sure to do a post as soon as I have made it. Have you made any lotion? Note: 5 Nov, 2011 I have been using this lotion for a month now. It has firmed up more as the inside house temps have started to drop. When I put this lotion on my hands the mixture heats up and again becomes oily. It seems more like a salve to me than a lotion because of its oily feel. I am mainly using it at night before bed and I don’t mind the oil feel since I am going to bed. I will continue to use it and see how it goes as my skins drys out more and more as the winter months approach. 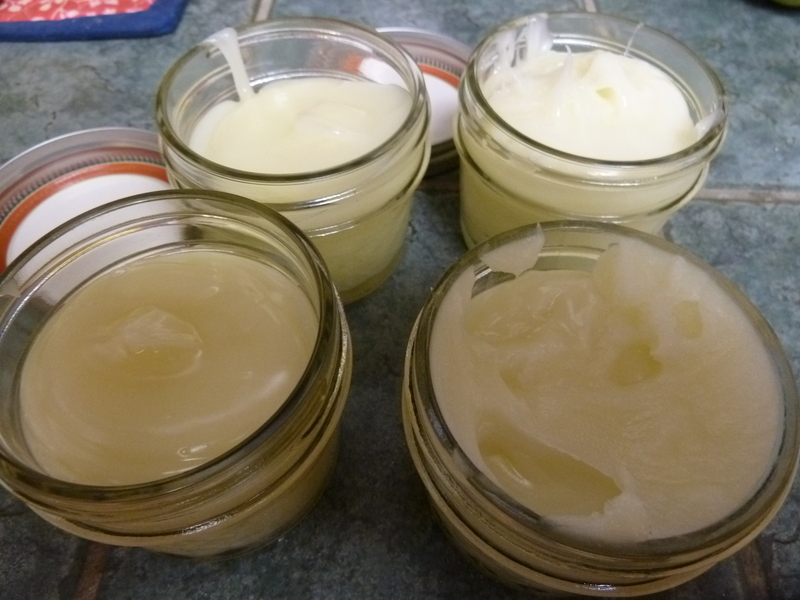 This entry was posted in Homemade, Miscellaneous, Recipes and tagged Making lotion. Bookmark the permalink. Hi Dani – wow – that is a tough battle. I have heard that diet changes can help eczema too. I get small patches of eczema in the winter, so I will be making that eczema fighting lotion soon with winter on its way. Basically, anything that will help the dry winter skin in a plus. And even better if I can find a recipe that I like and make it myself. Oh, fantastic! 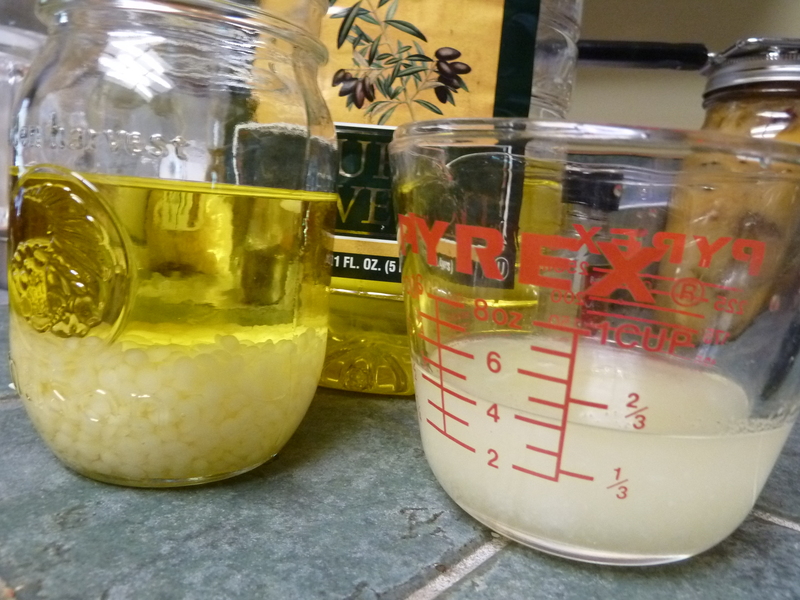 I use coconut oil and baking soda for making homemade deodorant. I may have to pick up some bees wax and give this a try! Hi Karenish, thanks for stopping by. The more I use this lotion, the more I like it. I still haven’t used it during the daytime…it is just too greasy/oily. I am solely using it at night on hands and feet. I am still hoping some we cool down here that it will change somewhat. I found a few other lotion/cream recipes a few days ago that I hope to try out soon. Do you have a post about the homemade deodorant you make. Too much baking soda and I have a rash. I will head over to your blog and see what I can find. I have been making soap for a few years and I just made a lavender soap. I have been meaning to do that for a while and FINALLY got to it. I love love love making soap. It is addicting. Have fun making it with your friend!